Eelgrass has long ribbon like leaves with very distinctive veins like that of celery. 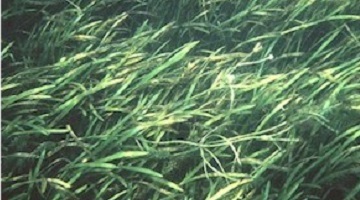 Eelgrass is a submerged plant with the exception of white flowers that either grow on long stalks, or fall off shorter stalks and float in the water.Leaves are thin and ribbon-like, and are usually 1/2 to 3/4 inches wide and grow to be 3 to 4 feet in length. The leaves have very visible raised veins and grow in clusters. They spread through the use of runners (meaning they do not need seeds or spores to replicate) and oftentimes form underwater meadows. Commonly found on the eastern 2/3 of the U.S. (from the Great Plains and eastward). Can be very difficult to control. Hydrothol Granular and Dibrox will get mild control.